Extensive input/output support, including support for VASP (http://cms.mpi.univie.ac.at/vasp/), ABINIT (http://www.abinit.org/), CIF, Gaussian, XYZ, and many other file formats. Powerful analysis tools, including generation of phase diagrams, Pourbaix diagrams, diffusion analyses, reactions, etc. 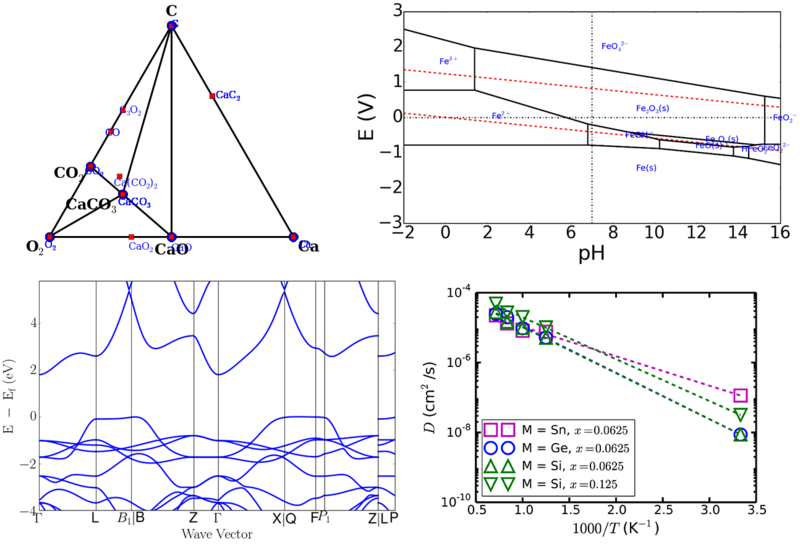 Electronic structure analyses, such as density of states and band structure. Integration with the Materials Project REST API, Crystallography Open Database. Please report any bugs and issues at pymatgen’s Github Issues page. For help with any pymatgen issue, please use the pymatgen Discourse page. Please note that the pymatgen Google group has been deprecated in favor of Discourse. Twitter. Follow to get news and tips. The code is mightier than the pen. Clone the Github repo and the latest html docs are in the “docs” folder. In Dash or Zeal, go to “User Contributed Docsets”, search for pymatgen and install. Pymatgen has supported both Python 2.7 as well as Python 3.x from version 3.0. With increasing support by most standard libraries for Py3k, it no longer makes sense to maintain this dual support going forward. Dual support imposes costs in terms of developmental effort, and also forces compromises in code quality and efficiency. Though some legacy clusters may only come with Py2k installed by default, the recommended approach in any case is to create an isolated Py3k environment. The pymatgen development team will phase out Py2k support over the course of 2018. From v2018.1.1, new features implemented in pymatgen no longer need to support Py2k (i.e., unittests do not need to pass Py2k testing), though existing features will still be Py2k compatible. From v2019.1.1, pymatgen will be Py3k only. The Materials Virtual Lab has developed a matgenie web app which demonstrates some of the basic functionality of pymatgen, as well as a matgenb repository of Jupyter notebooks for common and advanced use cases. We have deprecated the pymatgen examples page in favor of this more sustainable approach going forward. One of the ways you can contribute is to fork the matgenb repo and add your own examples. Below are a quick look at some of the graphical output possible. It is (fairly) robust. Pymatgen is used by thousands of researchers, and is the analysis code powering the Materials Project. The analysis it produces survives rigorous scrutiny every single day. Bugs tend to be found and corrected quickly. Pymatgen also uses CircleCI and Appveyor for continuous integration on the Linux and Windows platforms, respectively, which ensures that every commit passes a comprehensive suite of unittests. The coverage of the unittests can be seen on coveralls.io. It is well documented. A fairly comprehensive documentation has been written to help you get to grips with it quickly. It is open. You are free to use and contribute to pymatgen. It also means that pymatgen is continuously being improved. We will attribute any code you contribute to any publication you specify. Contributing to pymatgen means your research becomes more visible, which translates to greater impact. It is fast. Many of the core numerical methods in pymatgen have been optimized by vectorizing in numpy/scipy. This means that coordinate manipulations are extremely fast and are in fact comparable to codes written in other languages. Pymatgen also comes with a complete system for handling periodic boundary conditions. It will be around. Pymatgen is not a pet research project. It is used in the well-established Materials Project. It is also actively being developed and maintained by the Materials Virtual Lab, the ABINIT group and many other research groups. Please review the coding guidelines. Implement a metal warning for ISMEAR < 1 and NSW > 0. Misc bug fixes to input sets, including detection of metal systems and checking for standardization. Step-by-step instructions for all platforms are available at the installation page. Before installing pymatgen, you may need to first install a few critical dependencies manually. It is highly recommended that you use Python>=2.7.9 or latest 3.x. In fact, unless you are very sure you have dependencies that require Python 2, it is highly recommended that you use latest Python 3.x. Installation has been tested to be most successful with gcc. Use gcc where possible and do “export CC=gcc” prior to installation. Numpy’s distutils is needed to compile the spglib and pyhull dependencies. Numpy should be the first thing you install. One of the best things you can do is to use conda to manage all this. The instructions for Shared cluster installation pretty much applies to any machine as well. Detailed installation instructions, including installation of option dependencies, set up for POTCAR generation, Materials Project REST interface usage, setup for developers, etc.are given on this page. For an always up-to-date list of extras, consult the setup.py’s extras_require. # Here, Python 3.6+ is assumed. # Install numpy and other pydata stack packages via conda. 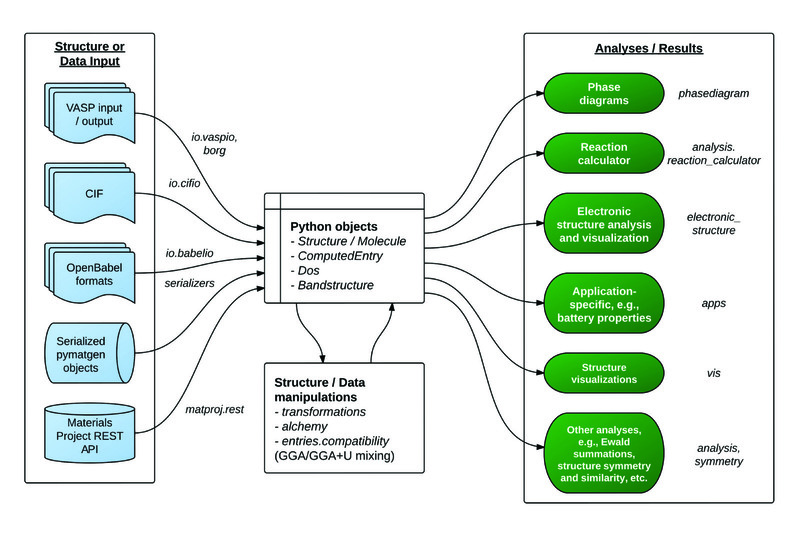 The figure above provides an overview of the functionality in pymatgen. A typical workflow would involve a user converting data (structure, calculations, etc.) from various sources (first principles calculations, crystallographic and molecule input files, Materials Project, etc.) into Python objects using pymatgen’s io packages, which are then used to perform further structure manipulation or analyses. >>> # like an Element object. >>> # You can create a Structure using spacegroup symmetry as well. >>> # Integrated symmetry analysis tools from spglib. >>> # Convenient IO to various formats. You can specify various formats. >>> # the format is intelligently determined from a file. >>> # Reading a structure is similarly easy. >>> # formats via the optional openbabel dependency (if installed). >>> # Changing the specie of a site. >>> # a disordered structure is created. >>> # such as sort, reverse, etc. >>> # Molecules function similarly, but with Site and cartesian coords. >>> # in the x-direction. >>> # You can now easily grab structures from the Materials Project. The above illustrates only the most basic capabilities of pymatgen. Users are strongly encouraged to explore the usage pages (toc given below). For detailed documentation of all modules and classes, please refer to the API docs. The founder and maintainer of pymatgen, Shyue Ping Ong, has conducted several workshops (together with Anubhav Jain) on how to effectively use pymatgen (as well as the extremely useful custodian error management and FireWorks workflow software. The slides for these workshops are available on the Materials Virtual Lab. To demonstrate the capabilities of pymatgen and to make it easy for users to quickly use the functionality, pymatgen comes with a set of useful scripts that utilize the library to perform all kinds of analyses. These are installed to your path by default when you install pymatgen through the typical installation routes. # Plot the dos from the vasprun.xml file. # types by specifying additional arguments. See pmg convert -h.
pmg structure --convert --filenames input_filename output_filename. # Obtain spacegroup information using a tolerance of 0.1 angstroms. # Visualize a structure. Requires VTK to be installed. The pymatgen-db add-on provides tools to create databases of calculated run data using pymatgen. The custodian package provides a JIT job management and error correction for calculations. The pymatgen-diffusion by the Materials Virtual Lab provides additional useful analyses for diffusion in materials. Pymatgen is developed by a team of volunteers. It is started by a team comprising of MIT and Lawrence Berkeley National Laboratory staff to be a robust toolkit for materials researchers to perform advanced manipulations of structures and analyses. For pymatgen to continue to grow in functionality and robustness, we rely on other volunteers to develop new analyses and report and fix bugs. We welcome anyone to use our code as-is, but if you could take a few moment to give back to pymatgen in some small way, it would be greatly appreciated. A benefit of contributing is that your code will now be used by other researchers who use pymatgen, and we will include an acknowledgement to you (and any related publications) in pymatgen. A simple way that anyone can contribute is simply to report bugs and issues to the developing team. Please report any bugs and issues at pymatgen’s Github Issues page. For help with any pymatgen issue, consult Stack Overflow and if you cannot find an answer, please post a question with the tag pymatgen . Another way to contribute is to submit new code/bugfixes to pymatgen. The best way for anyone to develop pymatgen is by adopting the collaborative Github workflow (see contributing page). In addition, some of pymatgen’s functionality is based on scientific advances / principles developed by various scientists. Please refer to the references page for citation info. Shyue Ping Ong of the Materials Virtual Lab started Pymatgen in 2011, and is still the project lead. The Pymatgen Development Team is the set of all contributors to the pymatgen project, including all subprojects. The full list of contributors are listed in the team page. Pymatgen uses a shared copyright model. Each contributor maintains copyright over their contributions to pymatgen. But, it is important to note that these contributions are typically only changes to the repositories. Thus, the pymatgen source code, in its entirety is not the copyright of any single person or institution. Instead, it is the collective copyright of the entire pymatgen Development Team. If individual contributors want to maintain a record of what changes/contributions they have specific copyright on, they should indicate their copyright in the commit message of the change, when they commit the change to one of the pymatgen repositories.